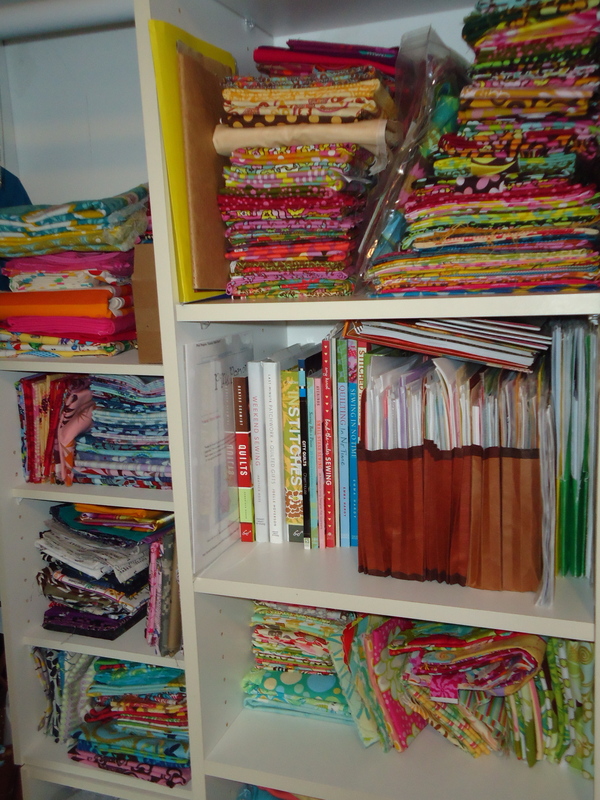 I am on a mission – a mission to get my fabric stash re-organized. You know me, I just spent the past way-too-many years working as a paralegal, so I can’t help but be an organized person. I do have to admit I have let my fabric stash go a little wild, well, okay, maybe just not organized enough for my preference. I think it has been more fun to just enjoy spending time in my sewing room and not worry about my how my stash is organized. After spending a recent weekend with a good sewing friend, I discovered great fabrics I didn’t even know I owned. 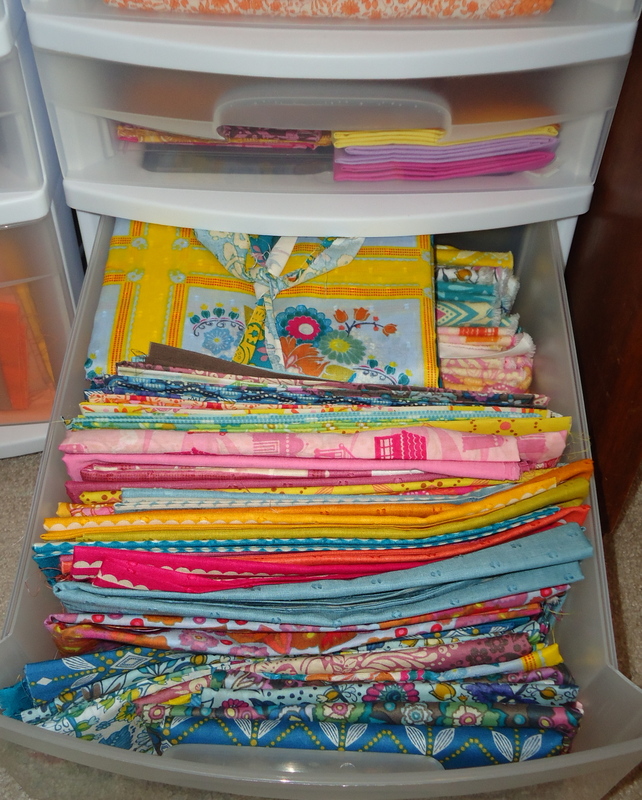 Hmm, we decided it was time for me to organize my fabric stash. I bought some new storage bins. Now I have drawers for solid fabrics and solid scraps. A drawer for special fabrics like voile and flannel. A drawer for novelty fabrics. 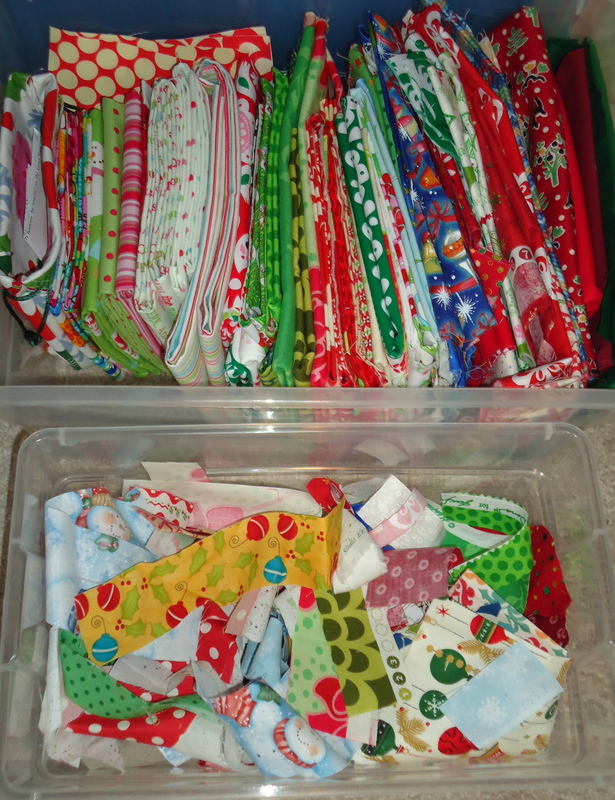 A bin for Christmas fabrics and a bin for Christmas scraps. I spent a little time lately making some new storage cubes. I even have some fabric buckets with bling to store snippets, trimmings, and tools! 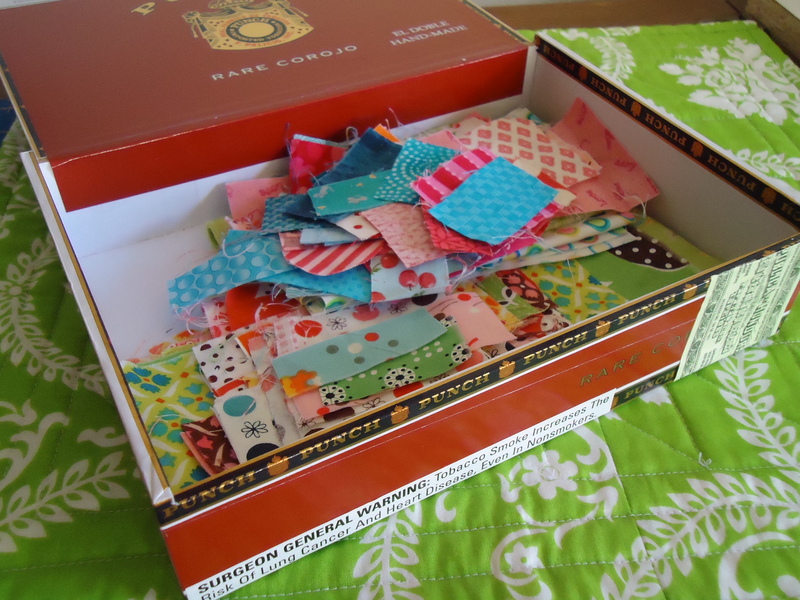 I also have a stylish place to store my snippets (very small scraps) for a future ticker tape quilt. I still need to take the time to organized the rest of my fabrics, which I will probably do by color. I’m happy for now to have at least taken inventory and re-learn what’s actually in my stash. i am super inspiring terri! 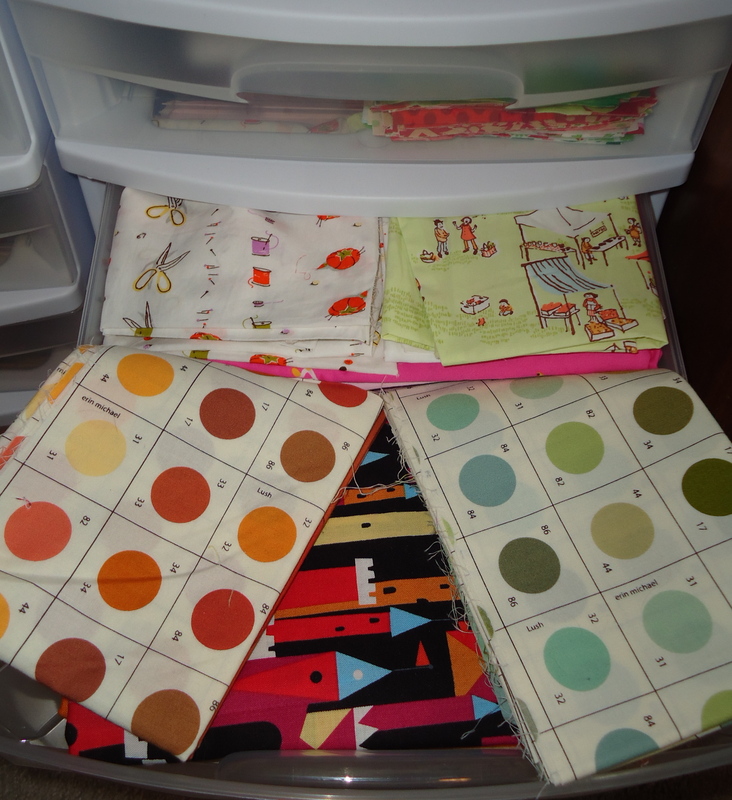 it sounds great to look at an organized stash of fabrics! i need to organize mine—-bad! it’s because i have been going through it a lot lately and it’s all over, totally mixed up. need more room though. Oooooh Terri!!! You are amzing – you have made fantastic fabric-cubes and ’round’ ones! Your new stores are great and mostly I’m grazy about all that nice ‘stuff’ you have in your boxes and selves!!! So much beautiful fabrics ! I shall see long time dreams about them! I use drawers that are the same – or very similar. I think you are making a little better use of yours though. Maybe I’ll take some pics of mine, too ;). 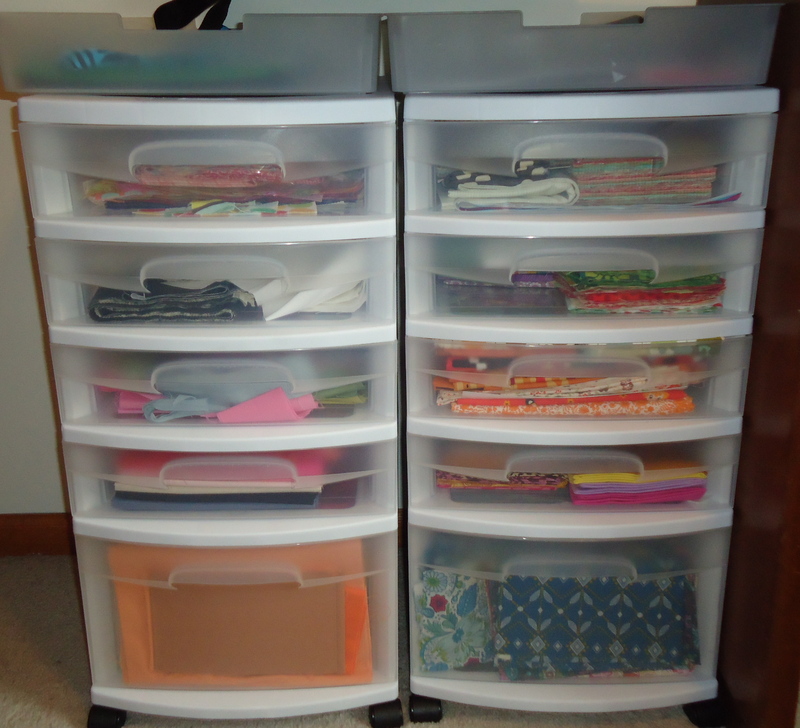 I love those buckets and cubes you made to help organize! That drawer with the Anna Maria Horner voile and flannel in it is so luscious! Wow! Look at you go, Terri! Great job!! Very inspiring to see…. I will have to give it a go in my craft room, too. It’s hard without proper furniture, but I’ll just have to be extra organized! Nice to see you using the cigar box!! 🙂 Yay! i’m organized too so i get you, it’s way more easy to work and enjoy work when everything around us is tidy. i think you did a wonderful job and it must have been fun! you should be proud too of those storage cubes, amazink let me tell you!!! I have those bins/plastic like you do. It’s super inspiring just to look at these photos! You have some amazing fabrics in your stash. It’s true that we sometimes we forget about gems we have if we don’t organize enough. 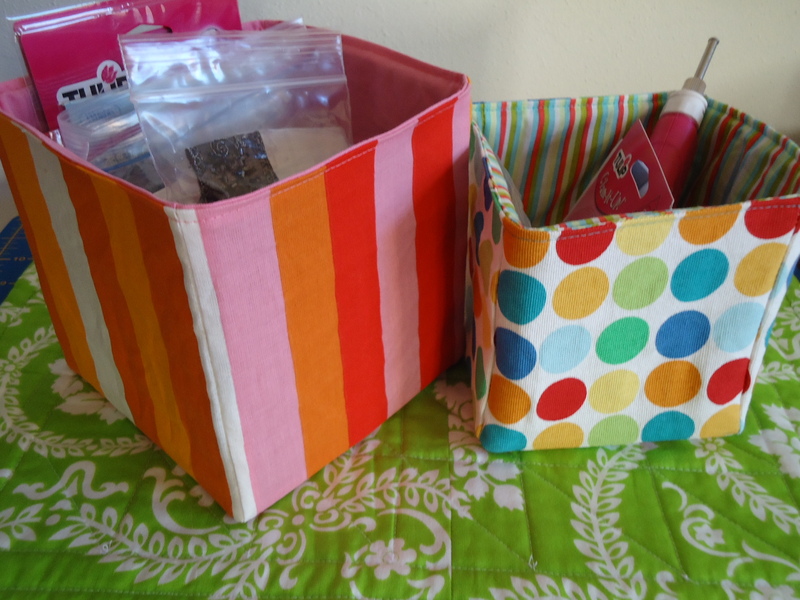 I’m also on an organizing kick this long weekend…not just fabric, but my house as well! Your stash is very pretty! You really did a great job reorganizing! Everything is so colorful and pretty! Those cubes and buckets are so cute. Great way to keep everything together. I know what you me when you say you need to get it together. When my friend and I cleaned up my craft room we decided we could tell what fabrics I really liked for we would find it more then once. If I would have had some organization I might have not spent money buying the same thing over but spent on another piece of fabric I wished I had. How is school going? Are you about done for Hoilday break. A semester almost down!!! 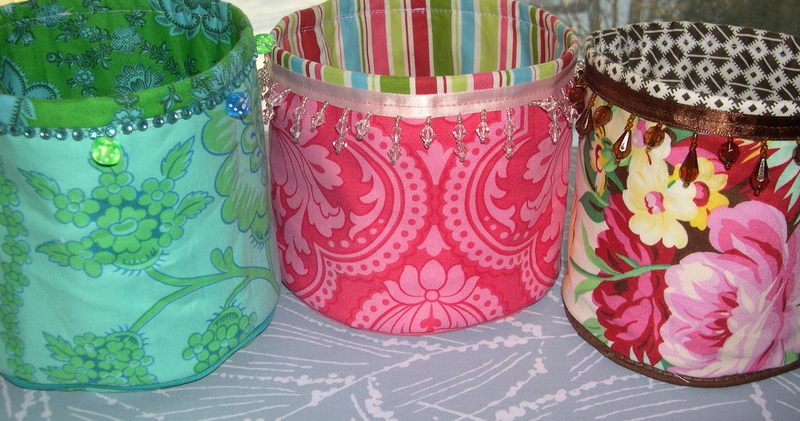 I am drooling over those fabulous fabric buckets! You could totally put some of those in the shop! Woo Terri! I love your storage cubes and buckets! Very very much. It looks great! Oh, how I wanna be like you when I grow up! Good for you! It makes such a difference, doesn’t it? oh, your organization make me so jealous. I don’t have as much fabric, but looking at yours make me wish I did. What wonderful projects you have in store. I’m completely impressed. What fun to look at your stash! so pretty…and organized! I’m glad you organized just to have a chance to look at all your pretty fabric. Did it make you want to start some new projects? You have so much fabric! I bet it feels really good to have it all nice and organized. I need to take a page out of your book, apparently, because my fabric stash is a huge mess. oooooooooooohhhhhhhhhhhhh pretty fabrics in all those piles. Great job Teri. You did a lot of work. I did all that about a year ago and it took me about 2 weeks of work doing it every single day. I am super organized and can’t stand things out of place although if you saw my room right now, you’d call me a liar. LOL I know when I was done it felt great so I’m sure you are thrilled too. It took me so long because I completely changed everything and the way it was stored in my room. All I can say is “God Bless You”. 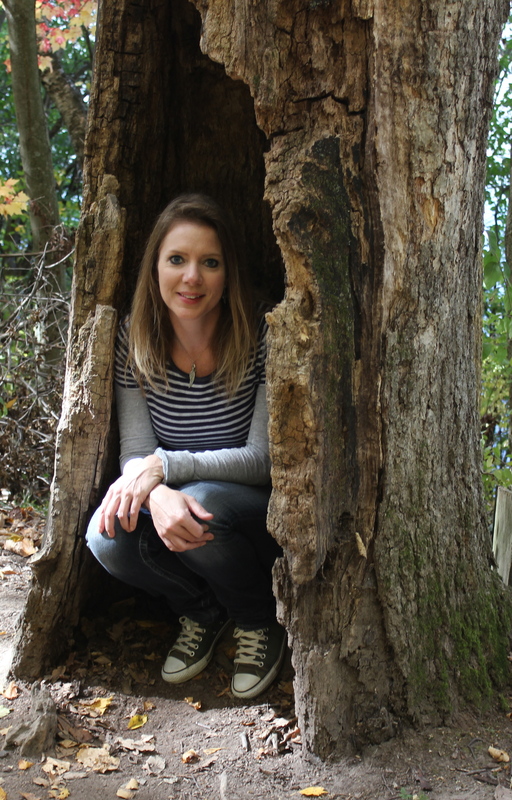 I just loved this post,now can you please save your pennies to come by my home and help me!!! Just love your colourful stash photo’s. Inspiration at its best. Dearest sweet terri, your fabric stash are sooo yummieeee!! You do have such wonderful collection! Makes me wanan go shop for more fabrics. 🙂 I was just organizing my supplies the other day…it was lots of fun! 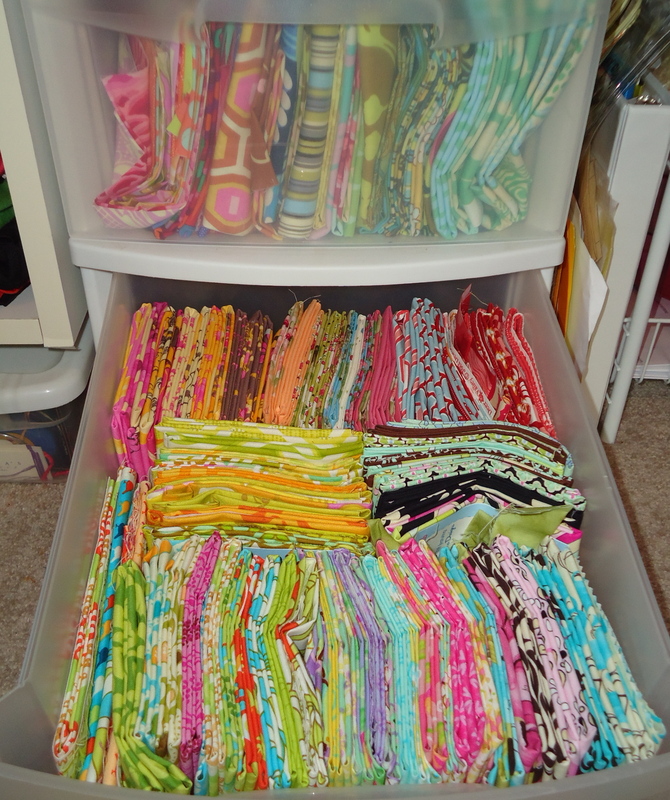 I love how you organize your fabrics….so inspiring! Have a lovely merry happy weekend and love to you! 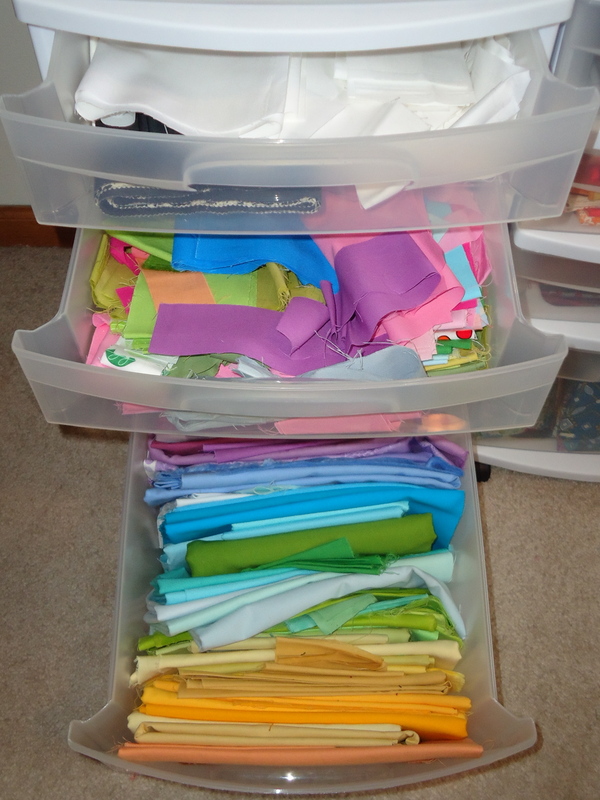 Love all your bins of fabric 😉 I don’t have that much fabric but I do have that much paper so I understand the want of keeping all the scraps and having them accessible. I use alot of your same storage strategies for my papers…and I could very easily start the same obession for fabrics as I have for fabrics…but I’m controlling myself for once. Do you want to come do mine now? I find I have to do this every 6 months or so to remember what I have in there. I’m way overdue. How did I miss this?!? Your stash looks heavenly:) I’ve been looking for desktop storage for smalls tools and your cubes and little buckets are perfect.